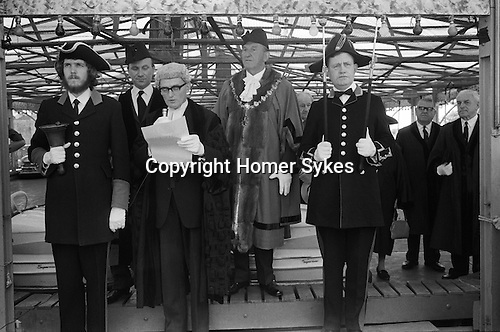 Southwold Trinity Fair, Southwold, Suffolk, England 1973. The Opening of the Charter Fair. Mayor George Cockerill attends the opening of the annual Trinity Monday Charter Fair. Traditional the Charter is read by the town clerk from the steps of one of the amusement rides. In 1973 the fair was declared open from the steps of the dodgem cars. George Cockerill Mayor of Southwold from 1972 -1974.